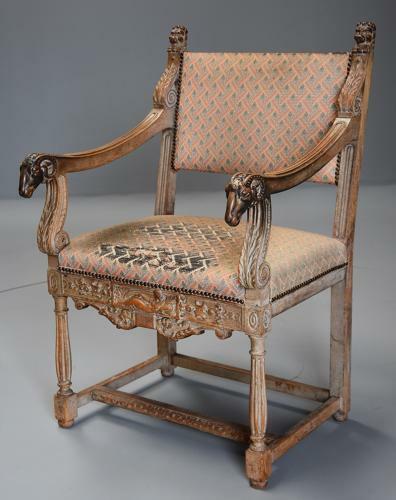 This armchair consists of two carved stylised lion masks to the top of each upright with carved acanthus scrolling brackets leading down to the shaped and carved arms, these terminating with superbly carved rams heads both with excellent patina (colour) leading down to carved acanthus scrolling arm supports. The back rest and seat retain the original tapestry upholstery leading down to a carved and shaped frieze to the front with central carved panel of a reclining female among foliage with carved lion heads below. The turned and fluted front legs having carved paterae to the top of the leg leading down to a block with turned bun feet, the chairs having square outswept legs to the back, the legs being joined by stretchers, the front one being carved. The armchair retains the original tapestry upholstery as we feel this gives the chair a character - however the chair can easily be re-upholstered either once purchased or please contact me directly to discuss. This chair is in very good original condition for age, is of stable construction and can go straight into a home.